At the AI Ethics Lab, we developed our “Ethics in R&D (ERD)” model to integrate ethics into AI research and development. Our model consists of 3 components, which together provides a comprehensive approach to ethics. Each one of these components can also be implemented in isolation. The ERD model provides a meaningful way of integrating ethics into innovation, where ethics complements and enhances R&D process. ERD model can be implemented fully or partially within companies, start-ups, research centers, and incubators. SUNY Oneonta Philosophy Department hosts one of the longest running undergraduate philosophy conferences in the United States.For one weekend in April, students from around the U.S. and from outside of the U.S. meet to present and discuss their research in all areas of philosophy. This event will bring together speakers who are internationally acknowledged due their innovations, initiatives, and new approaches in their respective fields. The event will be composed of 5 sessions. 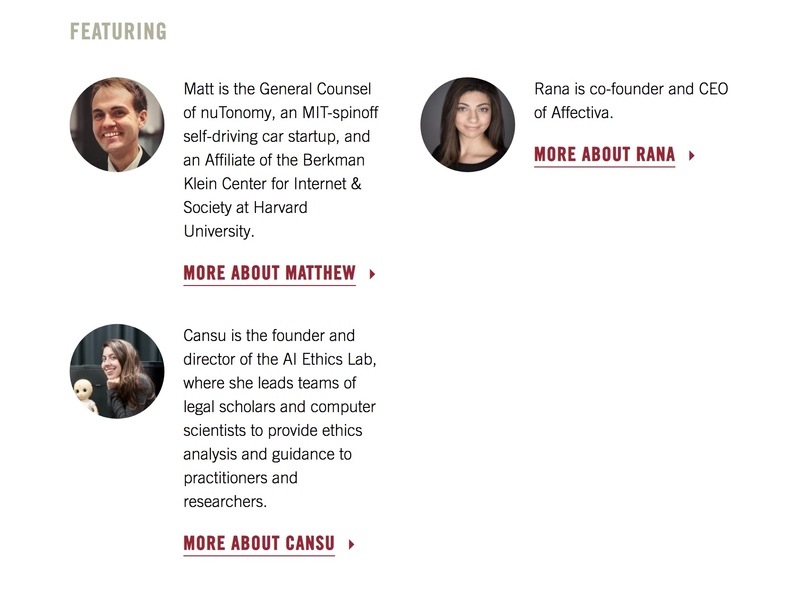 Speakers include Canan Dağdeviren (MIT), Cansu Canca (AI Ethics Lab), Cüneyt Özdemir (CNN), Erdoğan Çeşmeli (IBM Watson), and Gökhan Hotamışlıgil (Harvard). Robots that use AI systems have the capacity to interact with people as intelligent agents. This interaction becomes almost seamless when such robots process and use natural language to converse with individuals and utilize facial and bodily expressions to complement the conversation. As natural language processing, speech synthesis, and robot expressiveness develop further, we should expect AI-robots to ‘blend in’ to our normal course of life as companions and coaches among others. Such AI-robots present novel ethical questions regarding their communication of information. Decisions that determine how AI-robots communicate information will affect individuals’ knowledge formation, decision-making, and goal determination. “As Artificial Intelligence (AI) begins to percolate into our everyday lives, we must take a step back to think about the effects of such technologies on our lives.